Size of this preview: 800 × 541 pixels. Other resolution: 1,024 × 693 pixels. 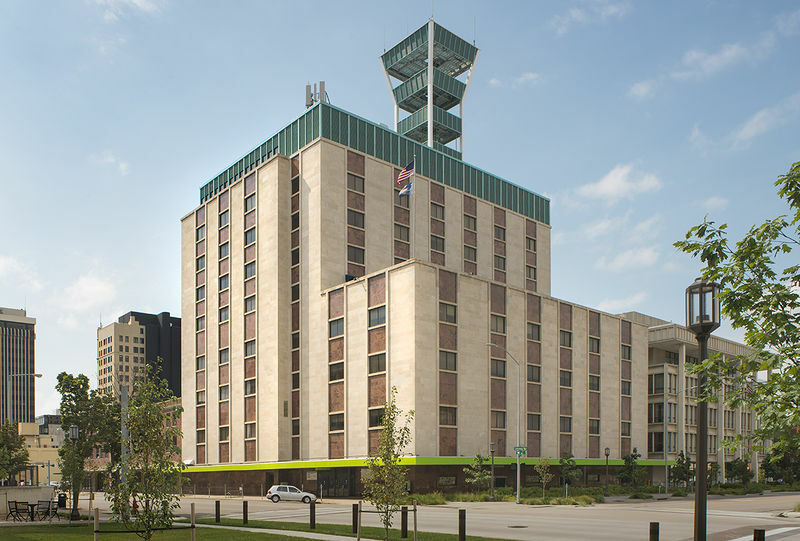 Description: Lincoln Telephone & Telegraph Company Building (1950-1951, 1958, 1967), 1440 M St, Lincoln, Nebraska. 1950-1951: Martin Aitken, Architect of the original 1950 building (first three stories of the west part of the whole, and a single-bay four story section along the east), City of Lincoln Building Permit 54003, November 13, 1950, Olson Construction Company, Contractors. 1958: LT&T Building Design Division in association with Kirkham, Michael & Associates Engineers and Architects, were the architects for the 1958 additions (five stories plus penthouse above the original Aitken building, and two-bay four story addition to the east of the original), City of Lincoln Building Permit 72669, May 27, 1958, Assenmacher Construction Company, Contractors. The massing of the building as seen today was designed by LT&Ts own staff, but the materials and detailing followed Aitken’s original design; see the enhanced working drawing for the Aitken elevation. 1967: Kirkham, Michael & Associates, Architects of the microwave tower addition, 1967, City of Lincoln Building Permit 93737, January 23, 1967, McKinney Construction Company, Contractors. View of south facade, looking northwest. Lincoln Telephone&Telegraph Company Building (1950-1951, 1958, 1967), 1440 M St, Lincoln, Nebraska. 1950-1951: Martin I. Aitken, Architect of the original 1950 building (first three stories of the west part of the whole, and a single-bay four story section along the east), City of Lincoln Building Permit 54003, November 13, 1950, Olson Construction Company, Contractors.1958: LT&T Building Design Division in association with Kirkham Michael&Associates, Engineers and Architects, were the architects for the 1958 additions (five stories plus penthouse above the original Aitken building, and two-bay four story addition to the east of the original), City of Lincoln Building Permit 72669, May 27, 1958, Assenmacher Construction Company, Contractors. The massing of the building as seen today was designed by LT&Ts own staff, but the materials and detailing followed Aitken’s original design.1967: Kirkham Michael&Associates, Architects of the microwave tower addition, 1967, City of Lincoln Building Permit 93737, January 23, 1967, McKinney Construction Company, Contractors.View of south facade, looking northwest. Public, non-commercial use, with credit, granted for file names ending in 'w' no derivatives. This page was last modified on 6 September 2016, at 14:22.